Keeping your carpets clean is important for a well-kept home. It can be challenging to find the best method if you have pets, mud, and other tough stains to contend with. Steam cleaning, also known as hot-water extraction, is the best method for heavily trafficked carpet. You can hire a professional, rent a machine, or buy one. This method works by sending hot water into the carpet at a high rate of pressure. If you buy a machine, the Hoover Max Extract 60 gets high reviews and retails for about $160. Hiring a professional service runs about $121 to $233, and the average price to rent a machine is $35 per day. Vacuuming works best for a house with high and low activity carpet areas. Better Homes & Gardens recommends vacuuming high activity areas once or twice a week and leaving a whole-home vacuuming to a less frequent schedule. To be most effective, go slowly with the vacuum and count to three with each pass. This allows the vacuum to get all the dirt out that might be missed if you move too fast. The best method for removing stains according to Real Simple is to blot it gently with a damp cloth. By blotting without rubbing or using water, the stain will come out eventually and will not be made worse by using other methods. If you need your carpets professionally cleaned, but you also need to use them right away, the best method is dry cleaning according to Angie's list. Carpet cleaners are placed on the carpet, and the chemicals work on the dirt until it is removed with a vacuum. The carpets are ready immediately without the wait times you have with steam cleaning. People with allergies find having their carpets cleaned difficult as they can react negatively to the chemicals. 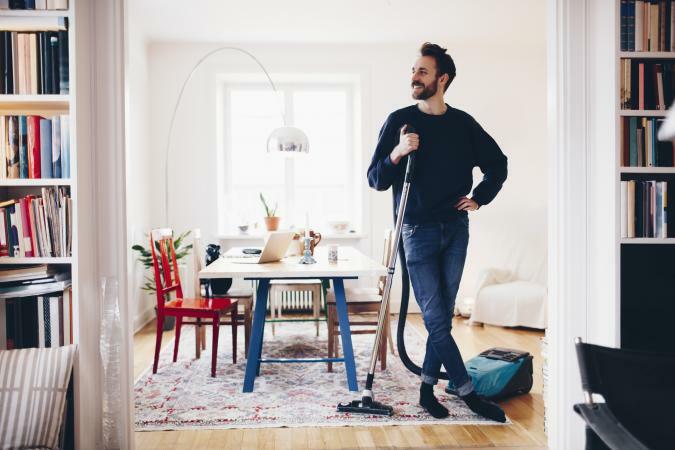 The National Center for Healthy Housing recommends people who suffer from allergies vacuum regularly with a cleaner that has high filtration features. The Shark Rotator Pro Complete Lift-Away vacuum is a recommended best buy for allergy sufferers and retails for about $300. If you have dried-in stains on your carpet, Good Housekeeping recommends this method as the best option. Using two spray bottles, fill one with cold water and put a solution of 1/4 teaspoon mild dishwashing soap and 1 cup warm water in the other. Spray the soap solution onto a cleaning cloth so it is damp (not wet!) and gently blot the stain with the cloth. Repeat until the stain is gone. Take a second cloth and spray it with the plain water bottle and use this cloth to remove any excess soap from the carpet. Finally, blot this area with a third cloth to remove excess moisture. Take some paper towels and put them on the spot and put something on top to hold them down and leave it overnight. The towels should absorb any liquid and stain left over. If your carpet has mold, the best way to clean it is by removing it to an outside area or ventilate the room well. Use a stiff bristle brush to remove as much mold as you can and do this on the top and bottom of your carpet. You can use traditional carpet soap to clean it from there, but the best option is using an anti-mold spray. You must also clean the floor underneath to remove the mold there. The best method if you don't have a vacuum is to use a brush. Mix a solution of ¼ cup of dishwashing soap and a half-gallon of warm water in a bucket. Moisten the brush with the solution and brush the carpet in small areas and repeat. This method is most effective if you vacuum after but can work very well if your brush is your only cleaning option. Pet urine requires more than just the usual carpet cleaners. Special enzymatic cleaners formulated to break down the urine are the best method to remove it from your carpet. You may think it is gone because there is no smell, but your pets' sense of smell is much better than yours, and they can continue to urinate on the carpet if they still smell it. You can use a black light to find urine deposits you may have missed. Coffee can stain a carpet and be difficult to remove. The best method is to mix a solution of one tablespoon dishwashing soap and of white vinegar and two cups of warm water. Dip a cloth in the solution and use the blotting method until it's gone. Use a sponge or cloth moistened with cold water to rinse the area and use a dry cloth to dry.